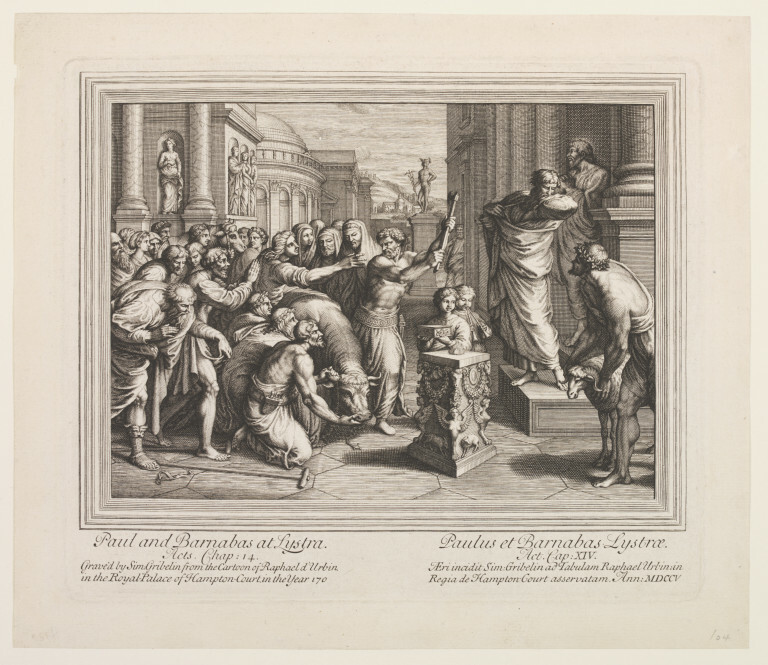 This picture represents the moment when the people of Lystra, impressed when Saints Paul and Barnabas heal a cripple (seen on the right), mistake them as gods Mercury and Jupiter and prepare to make sacrifices in their honour before Paul and Barnabas beg them to stop. This print is in reverse of the Cartoon from which it is derived. The so-called Raphael Cartoons are seven full size designs for tapestries by the great Italian Renaissance artist Raphael (1483-1520). They illustrate passages from the Bible concerning the lives of Saint Peter and Saint Paul. None of them is smaller than ten feet high by thirteen feet wide. They belong to Her Majesty the Queen and have been on loan to this museum since 1865. The earliest print relating to the Raphael Cartoons dates from 1516, the year in which Raphael received final payment for the commission. It inaugurates an extraordinary case study in the history of printmaking, stretching over more than four hundred and fifty years and across a wide range of printmaking techniques. Simon Gribelin was the first printmaker to issue a complete set of prints of the Cartoons. When they came out in 1707 they carried a letterpress titlepage dedicating them to Queen Anne. Although they met with success it was nothing compared to that which greeted the set produced by Nicholas Dorigny in 1719. Gribelin was born in France but came to England around 1680. He was the most important silver engraver in London at the beginning of the eighteenth century. This meant engraving on the surfaces of watches, tea caddies, salvers etc. He was also a printmaker. 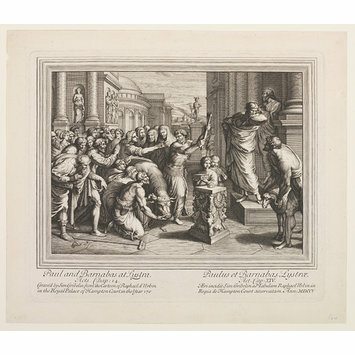 In the 1690s he published two prints after history paintings by Charles Le Brun, then in 1706 he engraved an altar dish with a scene of the Deposition based on a picture by Annibale Carracci. These may have led to the idea of engraving the Cartoons. The antiquarian George Vertue wrote in his notebooks "in London about 1700, the state of Print Engraving on Copper was at a low ebb… til about 1707. Mr Griblins cartons in print from the pictures of Raphael were well received, and vast numbers of them [sold]." As well as visual information each print delivers written information in the form of a caption in English and Latin giving the title, the biblical reference, the names of the artist and the engraver, and stating the location of the Cartoons. Horace Walpole, writing in 1763, said of these prints "their success was very great having never been completely engraved before; but they were too small a volume, nor had Gribelin anything of greatness in his manner or capacity: His works have no merit than finicalness, and that not in perfection, can give them." Dr. Johnson defined finicialness as "superfluous nicety or foppery". Each of the individual engravings shows the Cartoon in reverse while the view of the Cartoon gallery shows them the right way round. In March 1735 Gribelin's son was selling sets of his late father's prints of the Cartoons for 15 shillings. By 1753 they had dropped to half a guinea (ten shillings and sixpence) in the price list of the print-publisher John Bowles. The following year in the catalogue of the print-publisher Henry Overton II, they were listed under "Cheap Sets of Prints". In a town centre square with classical buildings a crowd has gathered to watch a sacrifice of two bulls and a ram. In the centre a man raises an axe to kill the bull standing in the centre. To the right, Saints Paul and Barnabas stand on a raised platform and there is a square plinth (altar) ornamented with carved festoons, angles, rams heads, animals a jug and a medallion, behind this stand two boys, one holdind a decorated box and the other playing pipes. In the background is a statue of Mercury on a plinth and behind is a landscape representation with more buildings. Lower left of the image a man has thrown away his walking sticks. The image is bordered by parallel lines forming a moulded frame. This print is in reverse of the cartoon from which it is derived and is largely faithful to it, except in that it heightens the composition to provide the tops of buildiings cut off in the original and alters the buildings in the background and foremost niche statue. Inscribed on the left-hand side of the print. On the right-hand side the text is repeated in Latin (date numerals on Latin side are MDCCV). The Sacrifice at Lystra; one of a set of seven (DYCE.2505 to 2511) engravings of the Raphael cartoons; engraving on paper; by Simon Gribelin (II); French School; engraved 1707; published 1720. Miller, Liz. 'From Marcantonio Raimondi to the Postcard: Prints of the Raphael Cartoons'. Display leaflet, 1995. Gilpin, William. An Essay Upon Prints, 1768, p. 80-81. O'Connell, Sheila. 'Simon Gribelin (1661-1733): Printmaker and Metal-Engraver', in Print Quarterly. Vol. II, 1985, p. 27-37.